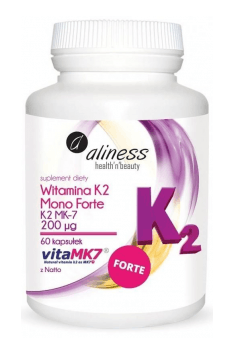 Aliness Vitamin K2 Mono Forte MK-7 is a unique supplement in the form of capsules, containing a patented, natural form of vitamin K2, i.e. menaquinone-7. This preparation has many health-promoting functions that positively affect not only blood coagulation but many others. Supplementation with menaquinone is beneficial to the health of the nervous and circulatory systems and strongly supports the skeletal system. In addition, the preparation is safe and completely free of GMO, which is supported by numerous studies. Vitamin K is a group of two natural compounds (vitamin K1 and K2) and a series of their synthetically obtained derivatives, characterized by a beneficial effect on the process of bone mineralization and blood coagulation. One of the two natural forms of Vitamin K present in the supplement is menaquinone, i.e. vitamin K2. It is a chemical compound produced mainly in fermentation processes, but it can also be found in animal products. It is distinguished by high stability and bioavailability. The main difference between menaquinone and phylloquinone, i.e. vitamin K1, is the circulation time in the body and absorption – in both parameters, vitamin K2 turns out to be more beneficial. There are several subtypes of menaquinones with different half-lives. The most optimal of them is MK7 – contained in the supplement, which is not only perfectly absorbed, but it also stays close to 3 days in the body and can more easily reach tissues other than the liver. The patented VitaMK7® form is a pure (99%) all-trans-menaquinone-7 that is completely free of any impurities, allergens, bacteria or chemical admixtures. What's more, this form is absolutely natural, obtained with the help of Bacillus subtilis bacteria that produce vitamin K2MK-7 by bio-fermentation of Natto. Thanks to its high purity, numerous tests and the recognition of organizations such as EFSA, VitaMK7® can be considered a completely safe preparation that can also be used by children. In addition, VitaMK7® ¬¬ is a very stable form, which does not require special storage conditions. The best-known effect of vitamin K on health is the improvement of blood coagulation. This is due to the properties of this substance to optimize the action of thrombin, which allows the formation of insoluble fibrin from fibrinogen, making a clot. Coagulation factors synthesized in the liver also require the involvement of vitamin K, which is necessary for the production of gamma-carboxylase. This enzyme activates the coagulation factor precursor by converting glutamine residues. The carboxyl glutamic residues obtained in this reaction are responsible for the ability of the factors to form a clot. Vitamin K is a known factor for maintaining a good condition of the bone structure because it allows retention of the optimal amount of calcium in the bones. This effect is due to the properties of menaquinone to regulate osteoblasts, i.e. bone cells, by activating osteocalcin. This enzyme, in turn, prevents the loss of calcium in the bones and promotes the formation of new bone cells. Menaquinone thus provides the structure of bones, thanks to which they retain their physical properties. Vitamin K2 MK-7 affects the condition of the circulatory system by preventing calcium deposition, thereby minimizing the risk of hypertension and the occurrence of cardiac events. According to research, vitamin K plays an important role in inhibiting the formation of calcifications by stimulating the production of MGP protein, which counteracts the deposition of calcium phosphate salts in the vessels. Thus, they retain the correct elasticity, which makes them less susceptible to damage that can lead to strokes. This activity of menaquinone is particularly beneficial for seniors who are most exposed to the progressive process of calcification of veins and subsequent unpleasant consequences. Menaquinone has a proven effect on the condition of nerve cells. In addition, it has a promising inhibitory effect on the development of Alzheimer's disease, which may be related to its participation in the synthesis of sphingolipids – compounds that build the walls of neurons. Their high level protects the cells from the harmful effects of pathogens, such as glutamate, which has a positive effect on the health of nerve cells. In addition, a high concentration of vitamin K ensures a good condition of myelin sheaths, which is extremely important for the speed of neurotransmission and prevention of neurodegenerative diseases. Supplementation with Vitamin K2 results in leveling out of the cytokine homeostasis, which becomes unstable with age. Cytokine fluctuation may further lead to the increased inflammation, which over time may become chronic. These changes, according to scientists, are one of the important factors contributing to the body’s aging and the subsequent consequences. Vitamin K2 regulates the production of, among others, interleukin-6, the level of which increases with age and it is responsible for initiating inflammation. To sum up, Aliness Vitamin K2 Mono Forte MK-7 is a top-quality dietary supplement containing a high dose of vitamin K2 MK7, which has extremely valuable health-promoting properties. The product is intended for people who want to ensure a good condition of the nervous system, proper bone mineralization and counteract the diseases of the circulatory system. Witamina K2 Mono Forte MK-7 200mcg 60 caps. In order to improve the digestibility of the supplement, it should be taken in the vicinity of a meal containing fats, which is related to the specificity of vitamin solubility. Vitamin K shows a much better effect in combination with vitamin D, due to the synergy of both substances. Therefore, to enhance the properties of these compounds, it is worth taking them together. Filling substance: microcrystalline cellulose, beef gelatin, humectant: glycerol, water.